As I sit in Sydney, lightly sunburnt after a day on the water following a very dear friend’s wedding, it seems a long time ago that I finished this sweater. Today is Saturday and we left London on Tuesday (or New Year’s Day). 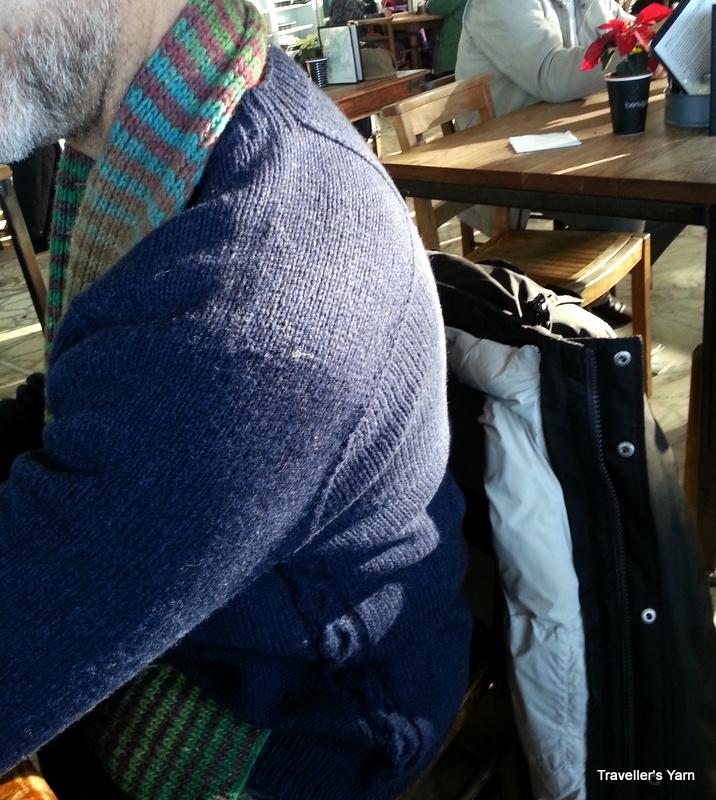 We were away for nearly 3 weeks, and my poor husband had to wait until the second last day of the holiday for his new sweater. 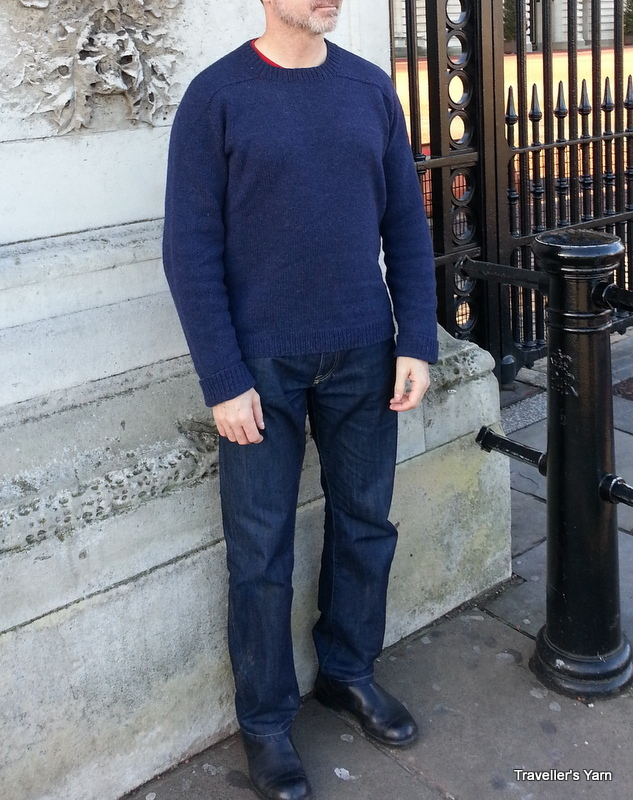 The photos were taken on New Years Day outside Buckingham Palace (with a couple at the cafe at the Serpentine Pond in Hyde Park). He greeted its finish with delight, helped by the fact that we had packed very light, and the 2 sweaters that he had with him were starting to look very familiar and tired. The sleeves seemed to take forever to knit, and they are slightly too long! 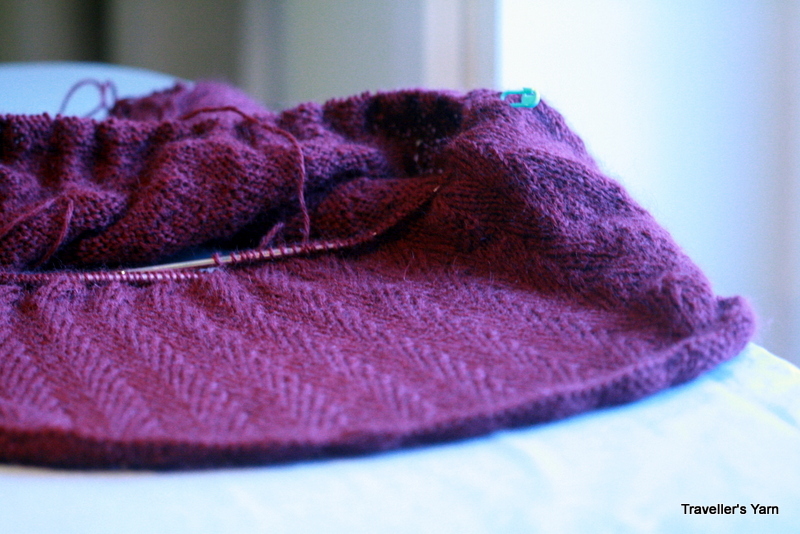 If they grow at all, I might need to do some surgery, but for now they are fine with the ribbing folded over. It is a very basic Seamless Hybrid with a discreet cable down the torso under the arm. Any requests for further adornment were not entertained. 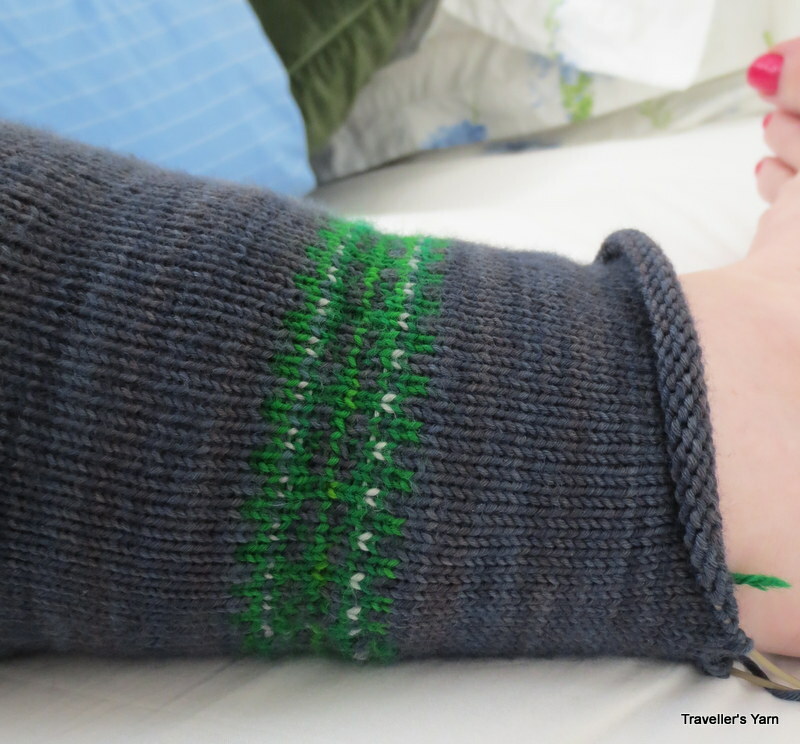 More technical details on Ravelry. The yarn is superb, and if you can track down any from Colourmart or in a destash I highly recommend it. I washed it using my usual washing soda technique (the medium strength solution on the linked page) and really enjoyed knitting with it. Older daughter has been waiting (not so patiently) for me to finish her a pair of socks – I’ve only been able to get knitting in on public transport (and at my first meeting of the Bar knitting group). The return to full-time work has gone relatively smoothly, but it has eaten into my crafting time. I’m on holidays now in France, and the flight here was when the socks were finally finished. The girls have grown so much this year, I built a bit of extra length into Older Daughter’s socks. I was thinking of slightly more artistic shots to show off the socks at the Chateau de Bussy-Rabutin, but you will just need to imagine that the view below was in the background (I promise it was). 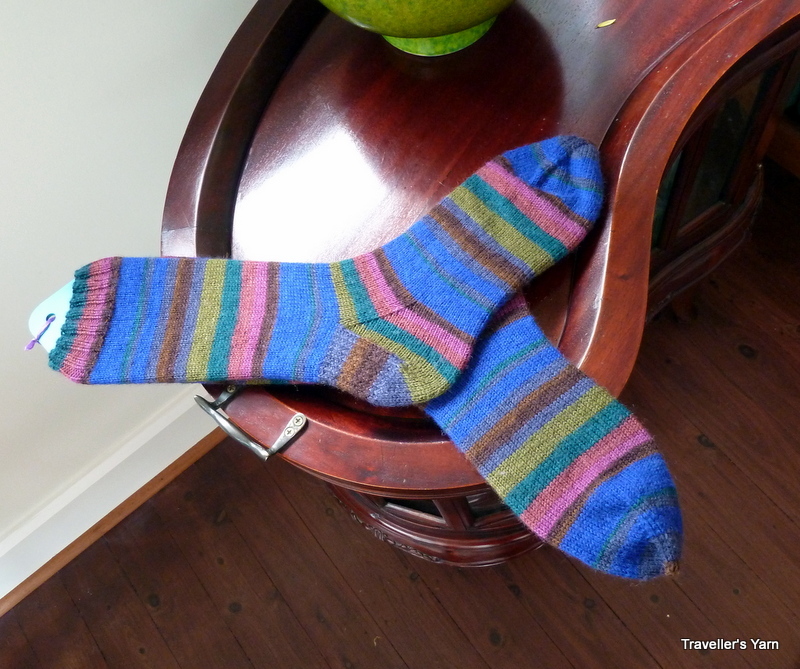 If you notice that that the colourway of the sock resembles Regia Kaffe Fassett Random Stripe, then you are not on your own – my sister bought it on Ebay and we both noticed the resemblance as soon as it was unpacked. More details here. I’ve been so busy that I delegated some knitting for the trip to Mum, and she made Older Daughter a Luxe Neck Warmer out of Colourmart cashmere to match her hat (thanks Mum!). Older Daughter loved the neck warmer, and wore it every day of the trip until the car trip to the castle. Then she noticed a loose thread and decided (using logic best understood by a bored 10 year old in the back of a car) to chew it off. Now we have a hole (Sorry Mum!). Unfortunately, I don’t have any more of this yarn with me, so the repair will need to wait until we return to Sydney. What can I say? 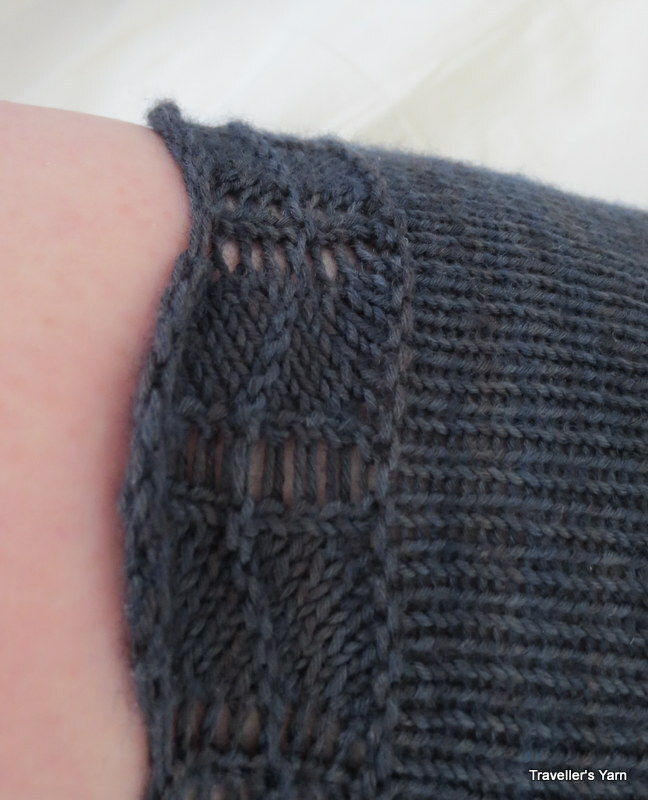 The start took me a while – it took me a long time to learn how to read the herringbone stitch. It is surprisingly easy to knit, but I was confused about how the knit 2 togethers would line up. The pattern is a 4 row repeat with action happening on the first and third rows, and I can tell you that the knit 2 togethers do not line up exactly, but shift by half a stitch each time they are knitted. On the first row of the pattern, the second stitch of the knit 2 together contains the stitch leading from the previous knit 2 together. 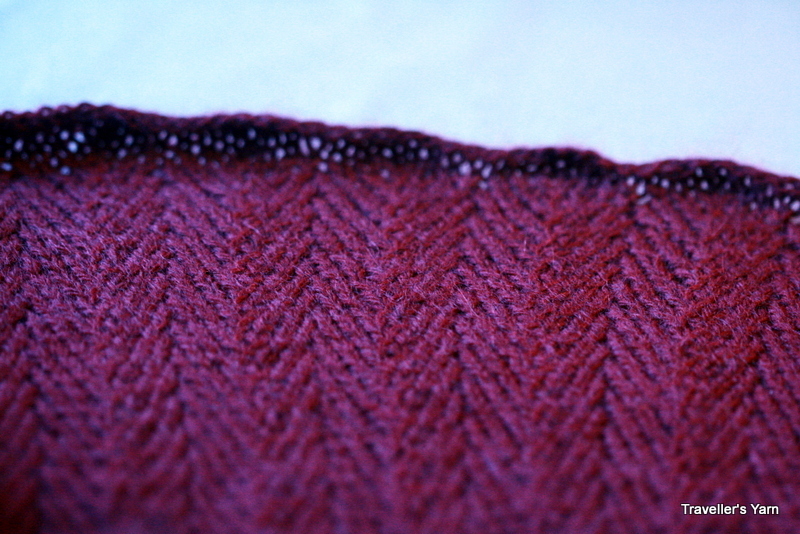 On the 3rd row, the first stitch of the knit 2 together contains the stitch leading from the previous knit 2 together. If my explanation is as clear as mud, you could just try following the pattern (that’s what I had to end up doing). It is exceptionally well written, and I found that when I just followed it, it worked. 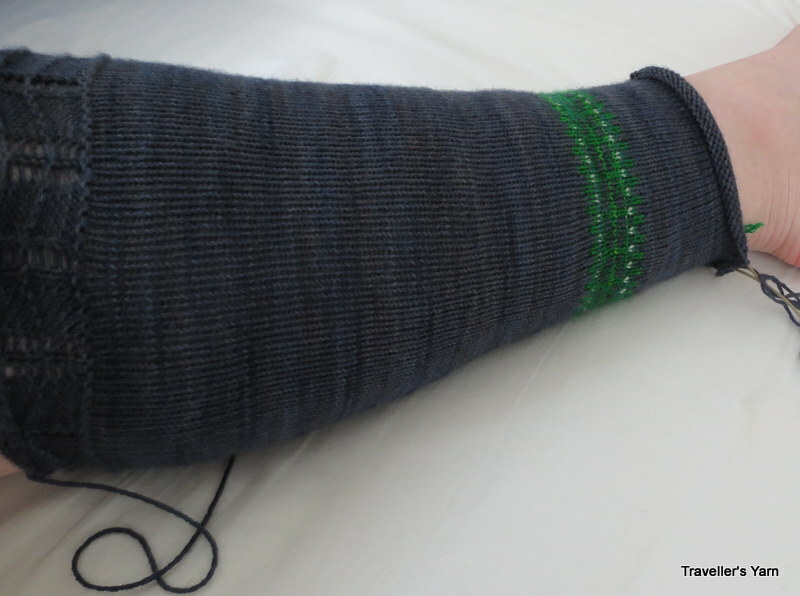 I am loving knitting with the Kid Classic – and it feels like it will be great to wear. I would like to get it finished before Winter ends here – I happened to be browsing the Vince website (for clothes that I can not afford), and came across this number. Luckily, I have something very similar already underway. On the win front, I found out last week that I passed the Bar exams. I sat them in July, and it was an interesting experience returning to high pressure studying with parental responsibilities. For those of you outside the British Commonwealth – this means that I will become a barrister. Watch the video below to get some idea of what I will be doing. Despite being blonde and sometimes prone to wearing red lipstick my career will be very much less glamorous than depicted in the video. I am unlikely to be involved in criminal law, but I will need to wear a wig and gown from time to time (much to the amusement of my daughters). 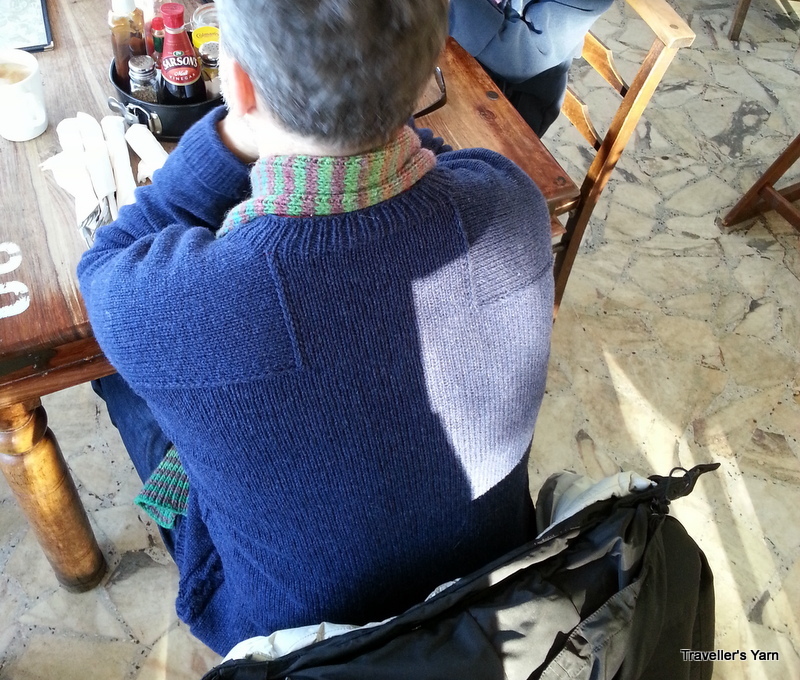 I plan to continue my knitting – the NSW Bar Association has a knitting group, and I fully intend to become a member. I’m not against books, rather very much in favour. We love libraries in our house, even if we tend to pay a lot in library fines. 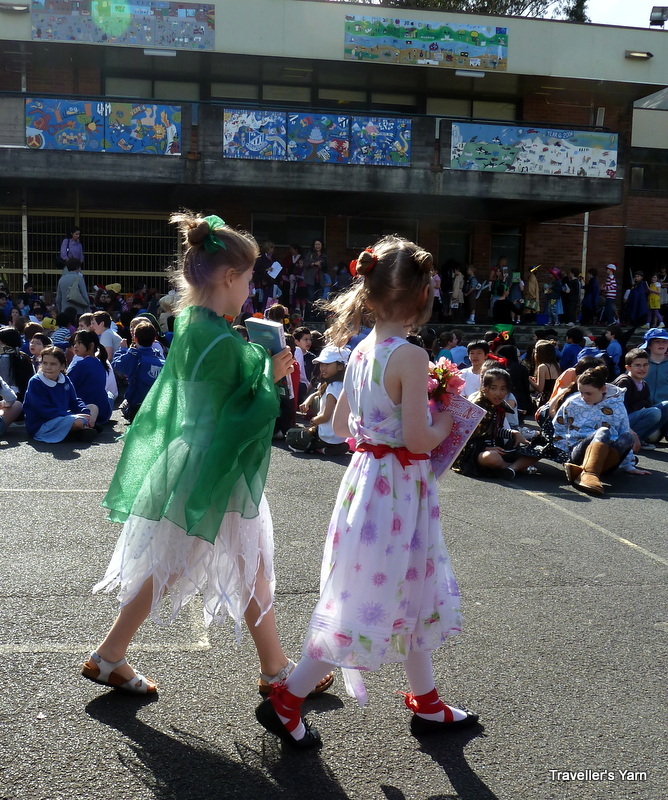 Even Book Week doesn’t irk me, but the Book Parade! Every year I am required to come up with a costume for 2 children from a book that we own, or have access to. My delightful offspring refuse to wear the same costume every year, and also refuse to go as a character who has no especial identifying marks (for example Judy Moody). Each year, the school gives us only a week’s notice, and then the inter-parent child wrangling begins. Wash, rinse, repeat. Anyhow if there are any desperate parents trying to figure out a costume – here’s what I did last year for younger daughter. All you need is a tatty old fairy costume and some 100% synthetic highly flammable green fabric and you have Silky costume – Silky being a fairy in the Magic Faraway Tree. 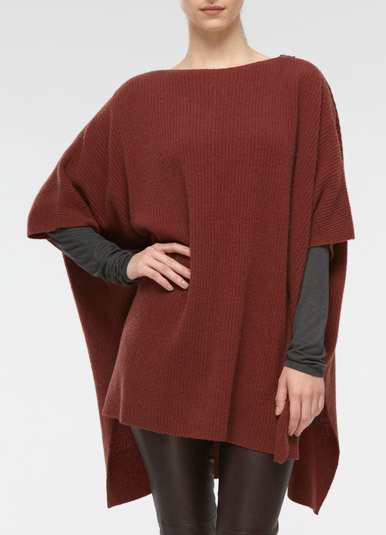 Cut out cape – no pattern necessary. I aimed for a length of cape roughly the same length as the neck – wrist measurement of younger daughter. 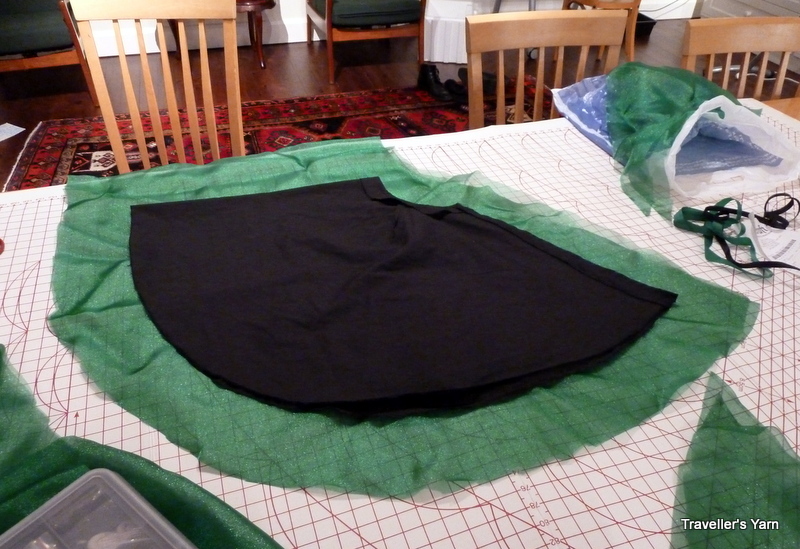 You are aiming for a roughly semi-circular shape – the one below was cut on the fold. I then zig-zagged all raw edges, and turned the neck edge over to make a drawstring casing where a green ribbon could go through, and ta-dah! With some cheap lurid green eyeshadow applied to younger daughter’s face, and we have Silky. 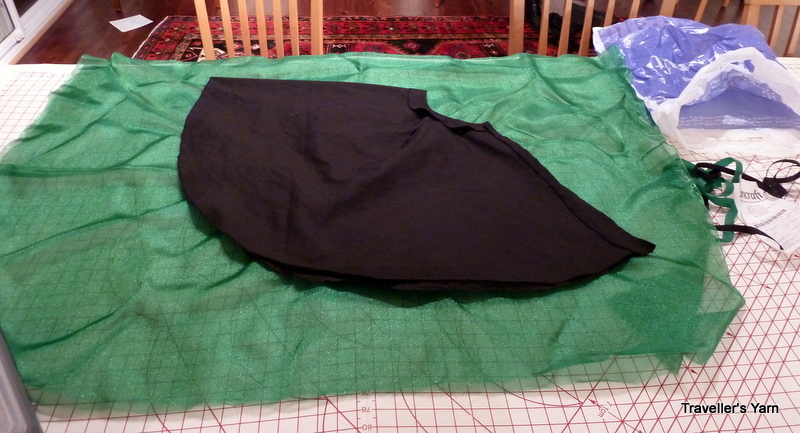 If you want to make a decent costume – follow the directions here. My daughter was happy enough, if inclined to grizzle about the nasty synthetic fabric scratching at her neck. The costume was not a prize winner. In contrast, when I was in year 2, my mother sent me to the Book Parade as the saucepan man from the Magic Faraway Tree. I was horrified, and was in tears for most of the morning. My sense of outrage and injustice was only increased when I won the prize for the best costume and was called up to the stage where everyone could see my costume. As an adult, I can see that the true injustice occurred because I received the prize, instead of it being given to my mother. Yet another pair of plain socks in Kaffe Fassett sock yarn for the Fireman. When I was studying frantically and pondering my future, I need plain therapeutic knitting, and it doesn’t get much plainer than these. They have been enthusiastically received, and in fact worn several times before I thought to block and photograph them. The whole exercise of studying as a parent required lots of adjustments – I am a crammer, and I had a lot to learn in a very short period of time. The Fireman was kept very busy doing a lot of child maintenance activities, and my parents and parents in law helped out enormously. I have new-found respect for anyone who has undertaken secondary or tertiary study while parenting. If you feel compelled to know the details – they are ravelled here. Now that my exams are over, and I anxiously await my results, I’m undertaking some more complicated projects – a Chaleur for the Ravellenic Games, and some Virve’s Stockings (because I can). There is a startling situation across Australia (and I suspect across the developed world). In cupboards around suburbia there are hundreds, no thousands of unused sewing machines. I don’t mean the kind where the machine is appreciated, but under-utilised due to the oppression of other life activities, but the completely unused, unloved, unwanted machines. When I was a teenager, my mother taught sewing at a technical college, and I was given a well-used mechanical Bernina. 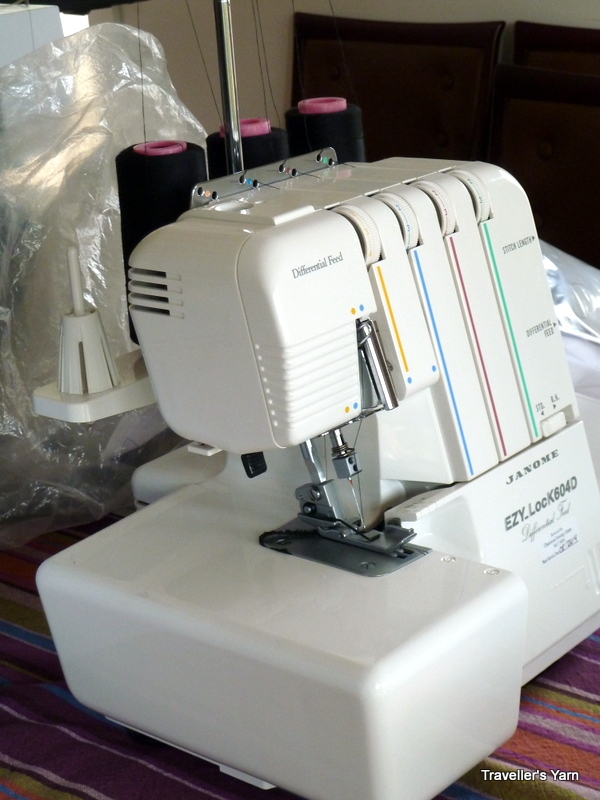 I loved that machine – it did everything that was needed for garment sewing. I really like my current machine, and now have two daughters who are champing at the bit, wanting to use a sewing machine. Not being so enthusiastic about them learning on my machine, I wanted to get another machine that I didn’t feel so precious about. Indestructibility was also a desired characteristic. 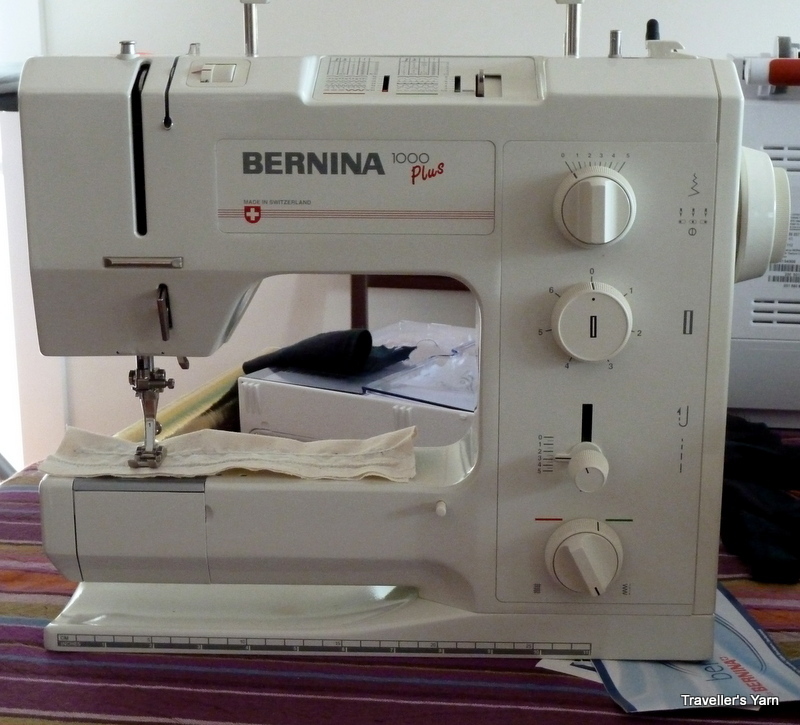 So you may be wondering – how can you set a Bernina free? You could waste your time bidding on them on Ebay, but that is an activity prone to frustration. Instead, I advertised for it. I posted an ad on Gumtree (I imagine Craiglist might work similarly in the States) and actually received a few replies. My (I mean the girls’) machine was sitting less than a kilometre from my house, and the owner had been wondering how to get rid of it. I paid a reasonable price (you should take the likely cost of a service into account when negotiating the price), and dropped the machine off to be serviced. By all accounts, sewing machines and overlockers need a thorough clean and oil after years of inaction. I was surprised to find that one place charged $145 for a basic service, while the other charged only $85. Apart from the Bernina 1000+ (made in Switzerland! mechanical! ), I was lucky enough to get an overlocker in the same transaction. They were both unwanted wedding presents, and had not been used for nearly 20 years. The overlocker was still threaded with its factory thread, and the Bernina had been used once. The only trouble now will be letting the girls actually use the new/old machine (at least I can save the overlocker for myself! ).